BMW Roundel logo center caps from factory BMW wheels where used in the center hole of the BBS RC wheels to give them a custom and unique look by leaving the lug bolts exposed. The BMW center caps are 4mm smaller in diameter than the BBS RC center holes, so spacer ring inserts had to be made from sound deadening material with adheasive backing (i.e. 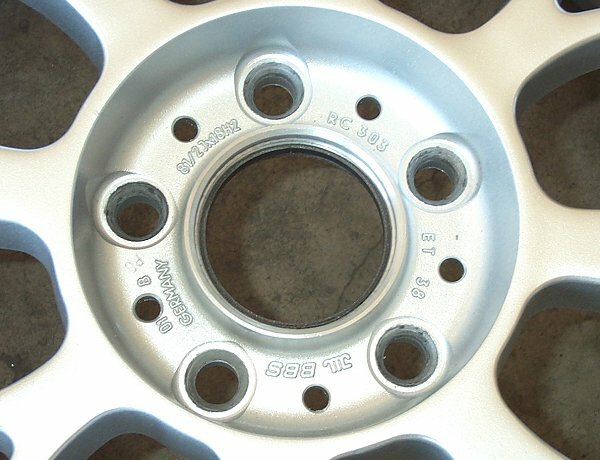 - Dynamat Original) to take up the extra space and give the center caps a lip to snap into. 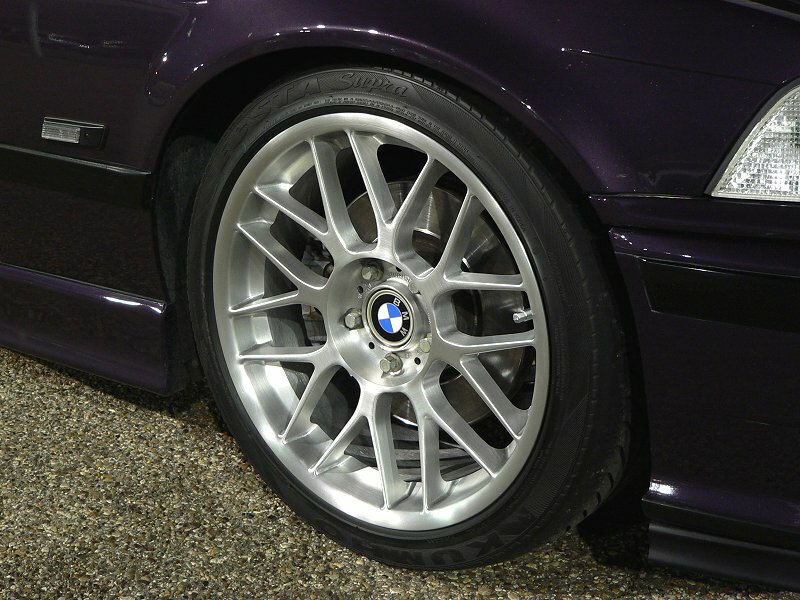 For each wheel, two strips of 1mm thick sound deadening material with adhesive backing were cut. Each strip is approximately 220mm long (cut to final length when installed) and 6mm wide. You'll also obviously need a set of factory BMW center caps. 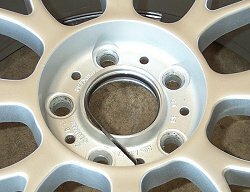 The first strip is laid down inside the center bore, directly on top of the threads that are normally for the BBS RC threaded center caps. This strip creates a 1mm thick spacer ring inside the center bore. Lots of pressure is used during the installation to ensure good adhesive contact. The extra length of the strip is cut off with a utility knife. The second strip is laid down directly on top of the first ring, again with lots of pressure to ensure good adhesive contact. 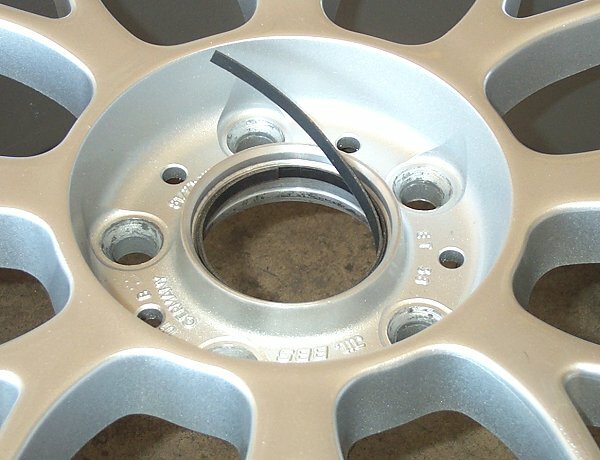 The seam of the second ring (where the two ends of the strip meet when installed) should be 180° from the seam of the first ring, so that the first ring's seam is sealed solid by the adhesive of the second ring. 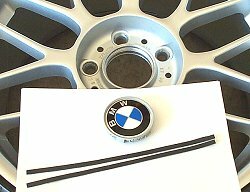 The installed strips create a 2mm thick spacer ring that holds the factory BMW center cap in place securely. 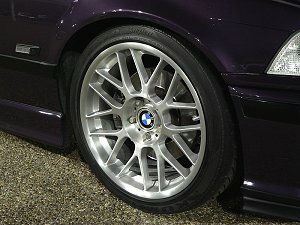 The 6mm width of the strips are the perfect depth to give the center caps a lip to snap into as if they were residing in factory BMW wheels. 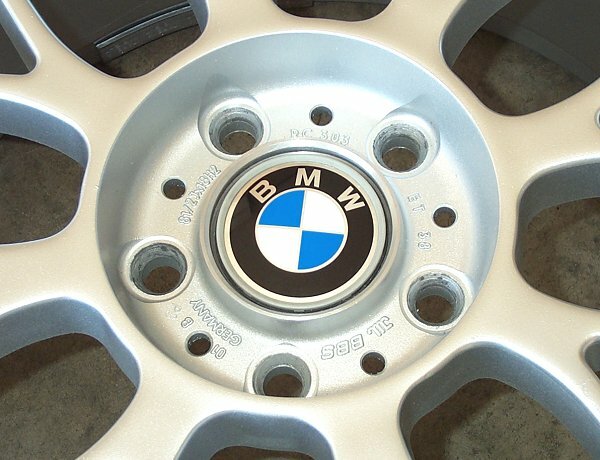 With the center cap in place, the spacer is virtually invisible and the BMW center caps look perfectly matched to the wheels as if they were an option offered by BBS!